The Tusk Foot Peg Nerf Bars With Heel Guards are the ultimate nerf bars for the serious racer. 1 3/8" alloy tubes are heli-arc welded at the joints and then brushed to a high luster. 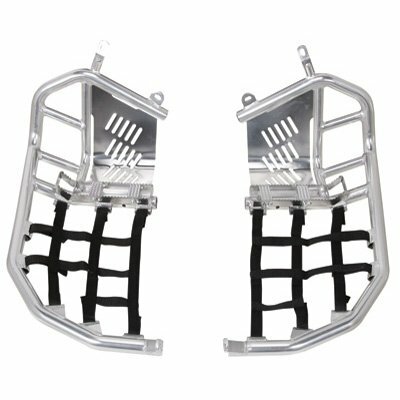 Extra wide stainless steel foot peg with a "kick-up" design incorporated into each nerf bar provides maximum traction and durability. Beefy heel guards are much stronger and better looking than stock plastic units. Features a trick looking laser-etched logo on both left and right nerf bars.